He signed an extensive deal in Berlin today to make recordings with the Staatskapelle Berlin, the Staatsoper unter den Linden, the Boulez Ensemble and members of the Barenboim-Said Akademie. DG says it will develop three recording series: Barenboim, the Pianist and Conductor, Barenboim the Chamber Music Player and Barenboim, the Educator and Innovator. DG are so happy they bought him a new hat, with matching coat and wall. This doesn’t sound like the magic elixir that will inspire sales, an invigoration of the recording industry, or anything resembling a profit. Much like the American political scene, same old faces, SOS. Ennui ensues. I can’t remember the last time I bought a DG recording. Try Krystian Zimerman’s latest recording, Schubert’s last two sonatas, released late last year. Superb! And Lisa Batiashvili’s new Prokofiev disc. Absolutely outstanding! I wanted to say I’m going to get some popcorn and sit on the couch watching the pointless mud fight between the “it is old and therefor better” against the “it is new and therefor better” crowds. But somebody started already. 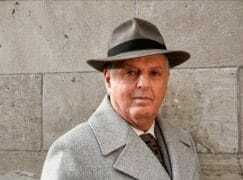 Barenboim is a mighty musician, but I don’t know how much he actually cares about recording. He seems to be more a live performance and “bath in the audience” kind of artist, who creates in the moment for the moment. For someone who doesn’t seem to care much about recordings, he certainly seems to make a lot of them. ahh……..if only LIVE recordings were possible with today’s technologies…. I have no idea what meaning it all has today or will have in the future. It sure would have been meaningful a few decades ago. The recording industry’s business model is obselete, and they still haven’t reeinvented themselves convincingly. Technology has disrupted a great many business models, not just the recording industry. When was the last time you set foot inside a cinema? I frequently go to the cinema though, so maybe that model has died less hastily than CD? Movie attendance hit a 25-year low in the US in 2017. There could be also some generational differences. I still buy CD’s, forty years since I started buying records (back then it was LPs of course). Digitizing my collection or buying the equipment for proper FLAC would be a disproportionate expense and hassle for me. That said, if I were starting now, I might have jumped in FLAC. But I hardly ever go to the movies. Beyond lifestyle reasons, a big turn off for me in the last two decades has been the deafening volume of the sound at movie theaters. For the same reason I hardly ever take my young children to movie theaters and watch with them the occasional movie at home. Strangely though, people still watch movies, and they still listen to music. Problem is, those who control the business today with their incredibly non-sustaining parasitic business models, Apple, spotify, Netflix, google etc. are a different species than the recording labels and movie studios of the past. In the past people were running those businesses, who had an intrinsic interest in the art form. Today those businesses who are on top of the market have no intrinsic interest in the art form, but only intrinsic interest in money. Down we go. Up got the bank accounts of a few. Up to the point where they realize that there is no emotional satisfaction itself by siting on a pile of cash in a dystopian world. This deafening noise has gone to television as well. Those smash, bash, crash noises you hear in every single documentary; I can’t do it anymore. So, I watch U-tube interviews, discussions, things of great political and social interest. The internet is disrupting television. Bring it on!! If you examine his huge discography – with a great number of remakes and re-remakes already – it’s difficult to see what he can record to make this deal worthwhile. He’s a truly great musician but his pianistic skills are now increasingly rusty (practicing is not his forte these days). Symphonically and operatically he has also recorded a very large chunk of repertoire. Chamber music likewise. This all seems to me to be an monster ego-driven project and unless he’s doing it for love rather than money, I fear DG may risk running a very large deficit. I certainly agree with what you’ve said about Barenboim’s performance skills on the piano. I witnessed that myself about 3 years ago. And he’s old now; put those two things together and there’s an inevitability right there. I’ve never been convinced by his Beethoven sonatas, to tell truth. As great as he is, it has to be said that his discography is already vast with remakes and re-re makes galore. This seems ego-driven and might leave DG with a large deficit unless DB is doing it for love rather than money. Recent piano recordings (Schubert and Debussy, for instance) are musically fascinating but technically flawed. His live concerts also show less than flawless technique. Sales of symphonic and operatic repertoire are not huge. I hope DG has an understanding finance director! Why ascribe that success to DG? They are only a label under the massive Universal umbrella. DG could be hemorrhaging money and surviving only due to its sister, pop labels subsidizing it. Universal’s management deserves whatever credit there may be here. Christopher historically yes that is correct. But then the majors decided they weren’t going to do that anymore, and pretty much shut down their involvement in classical music. I would speculate ( I’m sure somebody could confirm this) that one way or another, the bulk of the money keeping DG going might not come from the coffers of it’s parent company. For example, where I come from, major labels often successfully apply for State funding for projects. In fact it’s the norm. I guess what keeps DG afloat in these corporate fascism times is its extensive and valuable archive. Productions that have been paid for and still keep creating revenue. Even though the competition with Youtube; Apple and Spotify is one that no-one can win who wants more than just sleeping under the bridge and a hot soup from the Salvation Army in winter. Australia, in answer to your question Anon. Last I checked DG were selling their back catalogue off at bargain basement prices. I think it highly unlikely they would be able to bankroll new releases that way. == they bought him a new hat, with matching coat and wall. Just don’t sit there…. Get him to autograph the wall………. a reference to the Berlin Wall I suspect, so a canny marketing ploy? It is astonishingly sad that such a great musician and intellectual no longer has ties to Israel which is his native country. The fault is entirely ours. Thx for this update. I like most of what Barenboim records. Barenboim has (already) recorded all Brahms symphonies with his Berlin Staatskapelle, Mozart’s two piano quartets with Michael Barenboim, Kian Soltani and Yulia Deyneka, and Boulez’s sur Incises. There are many DG managers at this site… how come? A complex character, his courageous efforts in trying to right some of the historic wrongs in the Middle East have to be acknowledged, but putting aside for one moment any opinions on his musical contribution, one aspect of his career must be spoken about. Having risen to prominence in the late 60s, Daniel Barenboim has been a key member of our artistic leadership for the best part of 50 years. As such he must be seen as one of the chief architects of the decline. If there is one word that perhaps best describes this last generation of leaders (I would also include Simon Rattle here) it is ‘uncreative’. Their loyalty to the established order has been the key to their success, rewarded by allowing them something close to papal infallibility. They have reciprocated by resisting meaningful change at ever step. What they appear incapable of doing is listening, making a break from the conventional wisdom and recognising the clear mistakes that have and continue to be made. Big difference. Rattle at least spent his time building something up in Birmingham. Barenboim was certain to socialise with the important people from the beginning (even married one of them and stayed with her as long as she served his purposes). He still operates in this way. I think that’s a little unfair, I’m not saying that Barenboim is not a genuine and sincere person and I think it’s wrong so many years after the event to be making judgements about the private and the personal. I’m just saying that to rise to the pinnacle in this art-form, it’s not enough just to be a realist in terms of what change is achievable. You have to genuinely believe in the institutions in their currently form. Both these men fit that model perfectly. I think Barenboim is mostly a brilliant mind, politically and philosophically. He is a great stratege and knows well when to do and say what. To his merit I would say he is not blind to the problems, and tries in his way to do right. He has an enormous talent and it is more due to the political conditions rather than any shortcomings on his side, that it doesn’t fully come into being in his countless (too many!) performances. He cooperated with the establishment as it was the surest way for him to make a lot of money. Yet as he now also probably smells a change, he carefully shifts his emphasis accordingly. being music director of the Staatsoper, he worked countless times in opera productions with stage directors who openly molested and twisted the pieces, yet he never said a word against it – he knew it to be politically unwise. in one of the videos on his YouTube channel, the interviewer speaks about staging interpretations of pieces which mismatch the content, right at the very end of the clip with no response form Barenboim. Careful, not directly said by him, it is a gentle arrow in an exactly calculated direction, as well as a signal to a political alternative of his readiness for future cooperation, should it come to it. Establishment-artists stay as always weathercocks, changing direction as soon as the wind does. Hard to disagree with any of that Leo, well summed up. Hard to see where real leadership is going to come from though but what you just described is definitely not it. The kind of leadership you mean is still in the underground. Who writes tonal music? Who dares to openly defy the avant-garde history? Who dares to say that the majority of “stars” today in the classical music world are media hyped “fakes”, with no or too little significant artistic merit? The problem, at least in Germany, is systemic, in the sense that an artist’s success is NOT directly linked to his/her impact on their audience. You have all sorts of culture administrators functioning as middlemen, on which (because of the current structure of state subsidy) the audience does not have enough power. I would say, the majority of stars in the classical music world are indeed exceptional musicians, with only a few exceptions. Your assessment is not founded in reality. Yes there are some great musicians, who do not make it to the very top of the media circus for several reasons. But they often still have reputable careers and a loyal audience. my assessment is founded on my personal taste only, and my own knowledge – those are to me the only foundations possible for an opinion in such matters. Today it seemingly goes without saying that those musicians “at the top” are fantastic and everything they do doesn’t fall shorter of the highest caliber by default, and this is fact which cannot be challenged. Now THIS is not founded in reality. The quality of artists’ performance should always be exposed to critique and healthily questioned by the audience. It is not easy for anyone to keep a consistent high level of musical performance, and without critical public and press, the temptation to slack and suffice with the absolute minimum necessary is simply too big. And this, in my opinion, is exactly what happens. Too many people have too strong interests of these “stars” appearing to be “perfect” all the time, which is, again, unrealistic – and on the long run counterproductive. Nobody produces a perfect performance every time, and believing they do is absurd. But most “top artists” produce reliably competent performances nearly all the time (with the occasional poor performance), and some very very good performances. This is a higher standard than much of the past. Most second rank performers, while still competent, rarely produce really interesting performances, even if they rarely have disasters. DB has some wonders to offer:I am just listening to Mozart K595 with ANTONIO PAPANO. Wonderful-along with the Mozart concertos with the English chamber orchestra:a reference. I also cherish his Chopin Nocturnes and Mendelsohn’s Songs without words. On the other hand I don’t like his last Beethovn’s sonatas. Those are owned by another pianist.